We just recently remodeled our girls bathroom a few weeks ago and I wanted to share with you some of the things we did so that you can do them in your own homes. By adding a few inexpensive updates, you can totally change the look of the room. And, most of the changes we made are so easy you can do it too. One of the biggest and easiest changes can be updating your builder grade mirror into a framed mirror. A simple and easy DIY mirror project that anyone can do! One of the projects we finished was the remodel of our girls bathroom. This bathroom is sure to become one of the busiest rooms in the house in the near future and it was in need of a makeover. Pretty boring and blah color huh? !…what was I thinking? LOL! There are a few different things we did that I will share a “how to” for, but today I want to share with you how to frame around your basic “builder’s grade” mirror. This mirror in particular is a large beast. It is ten feet long…yes, you read that right. So there was no way we would replace this one by buying another one like we did here. We were going to have to frame in this mirror ourselves. So we bought some baseboard at our local Home Improvement store in 12 foot lengths. Then after measuring the mirror we cut two lengths to measure 10 feet. We made sure that the outer edge of the top of the frame also measured 10 feet. Then we cut the ends of the baseboard at a 45 degree angle on our compound saw. The height of our mirror was about 38 inches and so we cut the other two lengths to that same measurement and also cut these at a 45 degree angle. Then when all the cuts were made, we laid out the baseboard on cardboard boxes in the garage and painted them with our white paint. We ended up doing two coats of paint. We also made sure to paint halfway down the back of the baseboard. **This is really important! The mirror will reflect the other side of the baseboard and you don’t want the unpainted surface showing. Then we glued the bottom piece of the frame directly onto the mirror with white silicone and held it into place firmly for a few minutes. Then we taped the frame to the mirror to give it some added reinforcement to prevent it from moving. Then we let the bottom frame dry overnight to ensure it was firmly in place. (I don’t know if this was necessary, but since our mirror was so large and the wood frame fairly heavy, we didn’t want to take any chances). Then the next day we glued the other three frame peices into place (the 2 side pieces and the top). We used tape to hold these into place as well. Then when the frame had dried, we filled the corner cracks with putty and then sanded it down. Then we primed and repainted just the corners of the frame and it was finished! I LOVE how great the mirror looks. It changes the look of the whole bathroom. The mirror looks like a custom made piece and is a HUGE improvement from the builders grade mirror we had before. This is such an easy, fairly inexpensive change that anyone who is looking for a more updated look can do! (Our mirror did have small clips holding the mirror to the wall and we just put the frame right on top of them with no problem). 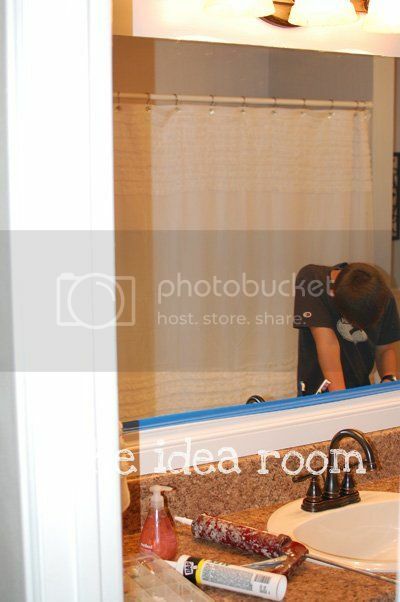 There are a few other projects within this bathroom that I will share with you…look for them…coming soon! **Go here to learn how to Make the Shelf! 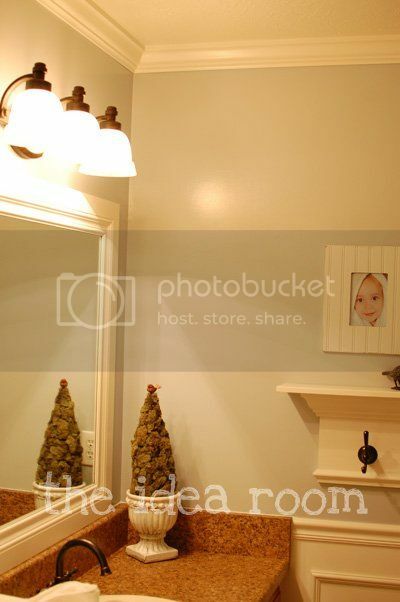 I've been meaning to do precisely the same type of project to jazz up my kids' bathroom! Now, with your help, I'll give it a try!! We did this, too! Such an inexpensive, great way to make a huge upgrade. I've been wanting to frame our mirrors for quite a while. Thanks for the instructions on how to do it! Can you get a close up of the clips you had holding the mirror in place (if you have them in another bathroom, of course). My MIL wants to do this and I am concerned that the clips are really going to be in the way. I replaced my clips with washers and did this same project, it cuts down on the bulkiness! WHAT DID YOU DO “WITH” THE WASHERS? What a wonderful makeover! I too would love to upgrade an existing and similar mirror but wonder what you did with the clips holding your mirror up. Did you adhere the mirror to the wall? If you left the clips in place I wouldn't think the molding would sit flush & glue correctly. I was just about to ask the same question two others have already asked. :) About the clips that hold the mirror in place! We just moved into a new house with that same huge mirror. Fortunately there is extra baseboard in the basement as well as tons of white trim paint! All I need to buy is the glue! :) Yippee! I totally love this!! It really makes the room look amazing. Now I just need to move out of my apt and into a house or something so my place can look cute too! I would love to do this…all the mirrors in my bathrooms are like this. Can you still remove the mirror from the clips or is is all glued together. I just think of needing to take it down in the future. Thank you for the tutorial…great step by step and pictures! looks so good! 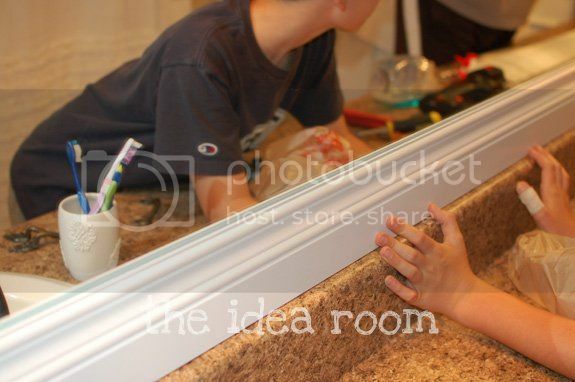 And I love the pictures of you kids wrapped in towels on the wall, what a cute idea for bathroom decor! Looks AWESOME!! Love the white frame! Great job with the mirror! But, I really want to know more about the shelf with the hooks in the background. I have been looking for something like this…was this a DIY project, or where did you buy it? Fabulous Job Amy!! I love it. My house is brand new and I still want to do this in my girl's bathroom. I'll be using your info. for help. 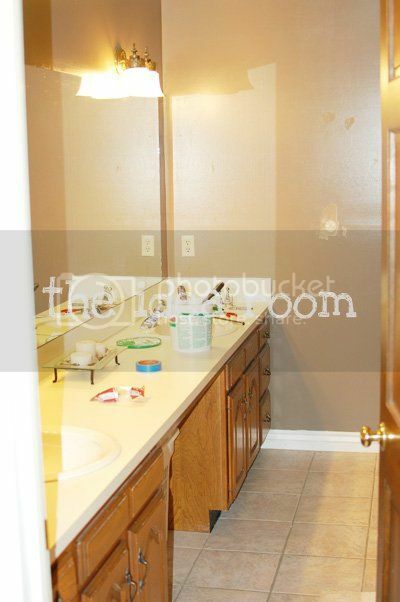 It gives a drab bathroom such character. Amazing what a little molding can do! i really want to do this…love it! I always love seeing your remodeling projects. I can't wait to see how you did the rest of it. Love this! And it seems pretty straight forward and simple. I'm curious what the edge of the mirror and frame look like? How did you hide the exposed edge? looks awesome! I have a mirror I have been wanting to do this to and I wasn't sure what to do about the clips, so thanks for mentioning that! What about those pesky little plastic tabs that hold the mirror on the wall? Or do you have those? I do on both of mine mirrors and it's the ONLY THING holding me back from tackling this project. Did you ever get a reply? I just posted asking the same question! I have answered this in some of the comments below! Great question! this is FABULOUS! We have a mirror very similar in our bathroom that I just can't stand and this looks so incredibly easy!! Thank you so much! I'll finally get my master bath feeling spa-like! Great Job! It adds so much to the room. Looks fabulous! Now I am almost wishing I didn't paint my bathroom such a bright color. I'm wondering the same question as everyone else…the tabs. Also, do you know where the lights are from? So cute and I like the color. They don't look builder grade to me. If you could point me in the right direction, that would rock. Thanks! Did you glue this right on the mirror? Doesn't it stick out from the wall when you look at it from the side? It does stick out from the side a bit. But if you put it a little over the edge of the mirror it is not as noticeable. 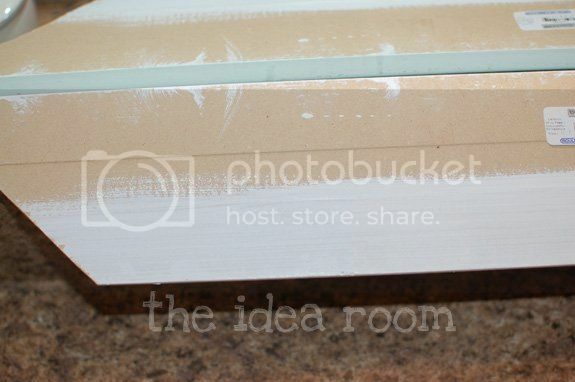 You can also slide in a thin layer of painters caulk to fill in the small overlap and seam. It then can be painted over and you won’t even notice it. You put the frame right on top of the clips??! How did you do that without there being a gap? I keep trying to devise a way to miter out a notch for the clips and it sounds so difficult. If you have some tips, I'm all ears! Looks great! YOu can also lay your molding agains the mirror and get a general idea of where the clips will fall and mark it with a pencil on your molding. Then you can easily notch out the back of the molding with a chisel or file and a hammer or use your dremmel. We now have the same light fixtures :) Luckily they were on sale at homedepot.com around Black Friday and the shipping was free. I was surprised by the "rainbow accents" on the glass but overall like the light fixtures. I do have some questions about the mirror frame–the tabs and also what did you do about the sides of the mirror? 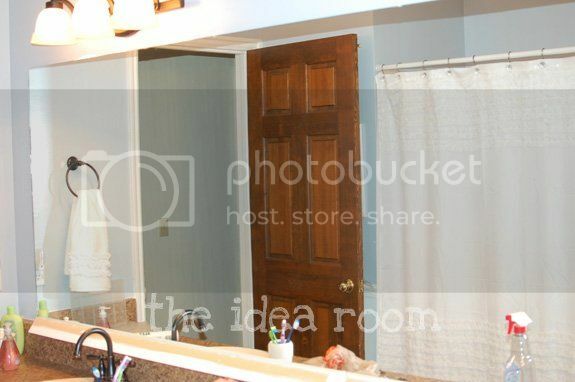 Does it look funny that nothing is covering the part where the side of the mirror is exposed right by the wall? I am wondering b/c our mirror is not fully enclosed between two walls. Hope my question makes sense, thanks again! The sides of the mirror we caulked and filled in the crack so that it is flush with the wall. It hides the mirror from the side where the frame doesn't come in contact with the wall! Hey there… I’ve saved this and bookmarked it and frankly, I’m ready to conquer the beast in our masterbath! However, I’m curious…. do you have any of those little holder things (the plastic ones) that hold your mirror to the wall? If so, how do you go about covering those? I finally did mine. However, my diary attempt was thwarted by warped wood. Didn’t realize that was the issue when the wood wouldn’t stick to the mirror. Cut up another piece and worked like a charm. Thanks for the how-to. Yay! So glad you were able to frame your mirror in. And thanks for stopping by to share it with me. I love to hear from my readers. We had the same problem with warped wood. Now I check them very carefully at the hardware store! Glad to hear you were able to frame your mirror too. Yes! Great point. We closely inspect our trim and moldings for warping and such before buying them. This can really affect the outcome of your overall finish! Thanks for sharing that tip! What is the name of the wall paint color you used. I love the blue – not too baby but still soft. beautiful! did you do anything with the vanity? I’m in the midst of attempting this project right now. I have the plastic clips, the big pesky ones that scare and pose the problem for all of us. first let me say I’m not using baseboard trim I’m using door trim, you can get it for around 10$ for a pack at HD. I cut notches out for the plastic clips so that the trim would lay over top of the clips and glue to the mirror just like described above. the first thing I did was lay my first piece over the clips and marked where they fell on the trim. next I cut the notches two different ways (I also cut the notches a little wider so that I could wiggle my trim back and forth to seat it better) the first way I notched my trim was to use my miter saw, cutting slowly I put two cuts into the trim then used a flat-head screwdriver and hammer to chisel to the notch. The second method I found easier was to use an oscillating multi-tool to make the cuts, I could make the cuts for the width and for the depth and then just clean it out with my screw driver. Next I just checked it would lay flat on the mirror and I was ready to mount. I hope that helps everyone asking the question about the clips because I had the same question and could never get an answer from any of the forums. I’ve got the clips workaround down, so thanks for all the suggestions. My next question is the long metal channel that holds the bottom of the mirror. Not all of these builder grade mirrors have these, but mine does and it makes a nice, more finished appearance. But am I going to need to cut out a 6 foot channel in my bottom framing piece? 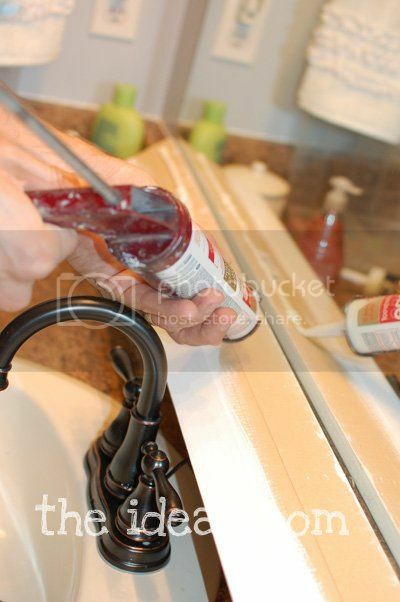 The metal channel cannot be removed; it seems to be caulked into place and sits right on top of the vanity counter. Casn’t find the workaround for this anywhere. Thanks. You may just have to cut out a groove to accommodate the metal frame piece. Yay! Thx SO much for answering HOW to fit over the awful plastic clips!! Can someone please answer me what kind of silicone to use? There are so many different ones out there and I thought they were mainly to be used as sealants not adhesives. If you can provide the brand and the label – that would help me! I tried looking at the label on the one pictured above but I just couldn’t make it out. Hi…Love the bathroom! Can’t wait to have my hubby tackle the mirror frame. Did you leave the vanity the same color or did you paint it white also? What is your opinion on wood color on a vanity versus trim and door color in the same room? My husband thinks if our door is light oak everything else has to be too, and I’m not sure. What color frame on the mirror would you reccommend with a light oak vanity? Love your style! I’m pinning your ideas for others too. Thanks. We painted our oak vanity white. Our cabinets were very old and beat up. We patched, repaired and then painted them white the same color as our trim but in a semi-gloss finish (because it is a kid bathroom and they tend to be messier and harder on things). Our trim is high gloss. Our interior doors are all a mahogany color though. I wish they were white but they actually don’t look too bad with the white trim. I kind of like the contrast in color though! Hi Amy, I love this idea and can’t wait to do it in my master bath. Can you tell me what paint color you have on the walls? I adore it and want to try it out on another one of my bathrooms that needs re-doing. Thanks! The paint color is called Upwards by Sherwin Williams! Is there any way for me to Pin this framed mirror tutorial? I’m not seeing the Pin button. simple yet so effective. definitely doing this in my bathroom. Grazie! Beautiful ! I am hoping do do this. Did u replace the counter top or is it a different DYI? We did replace the counter tops and had a company build us one to replace the old yellow formica countertop. found this and LOVED it! Thanks for the easy to follow step by step instructions! Looks pretty easy. You had said you put the frame up over the mirror/mirror clips. How does this look from the edge or side… does the frame stick off the wall a lot?…. The mirror frame does stick out a bit from the wall, but our mirror extends fully so you don’t even notice it at all! Thanks for a wonderful idea. We are trying to frame our bathroom mirror (which is quite large about 9 ft). After we assembled the pieces we noticed that the flat board that sits at the bottom is warped. Any tips on how to deal with this issue without starting all over again? THIS MIRROR IS BEAUTIFUL! WHAT CAN I DO IF I DON’T HAVE A COMPOUND SAW? These are such beautiful pictures of mirrors. I am really into interior decorating, and I have been astonished lately at the impact mirrors can have on a room. I have been researching different types of mirrors, and methods to use while installing, and I really appreciate your site! Have a great day! Thank you for posting this. This is going to be really useful for me as I try and help my mom remodel here master bathroom. However, I noticed that the mirror you framed has two sides that are flush against the walls. How would you suggest to frame mirrors that don’t totally cover the walls. Would you approach it in the same way? Yes…Approach it the same way. 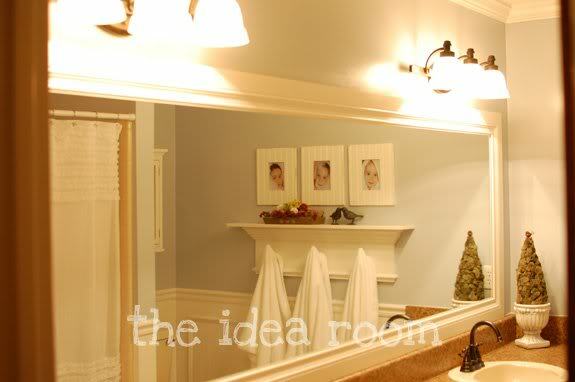 Then you can always add a strip of molding to cover the sides where the mirror does not lie flush. You can have it so that it meets the top of the frame so that it is all flush…or you can just use a quarter round piece to cover the hole or gap. Does that make sense? Were all four molding pieces glued directly Onto the mirror? Yes they were. Great question. What about the shelf unit in the middle? Do you buy or make it? It is beautiful and such a clever, original idea. Bravo!